When it comes to women in front of the camera, they are often cast in stereotypically female roles, such as that of a nurse or secretary. In contrast, only three percent of movie roles credited as “soldier” and five percent of “engineer” roles were played by women between 1995 and 2015. This discrepancy also extends to some of the most recognizable faces in world cinema. Emma Stone was the world’s best paid movie actress in 2017, taking home a cool 26 million U.S. dollars. However, these earnings would not earn her a place in the top ten in the list of the best-paid actors worldwide in 2017. This list is topped by Mark Wahlberg, who bagged 68 million U.S. dollars for the year, thanks to his roles in 'Transformers: The Last Knight' and 'Daddy's Home 2'. Turning to the small screen, 38.1 percent of all characters on streaming shows and 36.4 percent on broadcast television shows in 2014 and 2015 were women. However, among the characters on broadcast network programming in the 2016/17 season, only 34 percent were from a non-White background, suggesting that the industry has some way to go to address its issues of diversification. 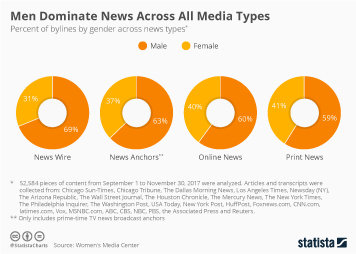 Journalism has also failed to shake off its image of being a traditionally male-dominated industry, as almost 63 percent of newspaper jobs are occupied by men. This trend can be seen across some of the largest newspapers in the United States, with The New York Times, USA Today, and The Washington Post all having a workforce which is over 60 percent male. Furthermore, in 2016, a female within the publishing industry could expect to earn on average 28 thousand U.S. dollars less per year than a male counterpart. Topic: Media use in the U.S.